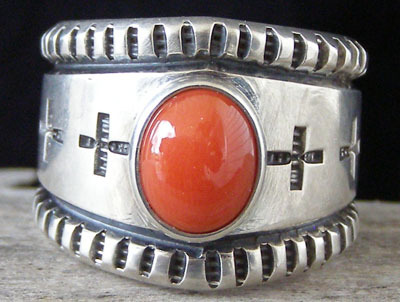 This ring is set with an oval of Mediterranean red coral in a wide, straight-edged bezel. Four corners crosses are deep-stamped along the equator of the band to left and right of the stone. Harrison used a cold chisel to notch the edges of this band. The band gently tapers towards the back of the shank. Hallmarked with a capital "H" on the outside of the band at the back of the shank.